A Calcium reactor is an important part of most any reef system. All stony corals and some critters like snails and conchs need calcium. While you can use CaCl2 or balanced additives, this is costly, time consuming and error prone. Investing in a high quality calcium reactor is an excellent way to get rid of the additives. The reactor works by dissolving CO2 in to the tank water passing though the unit. This lowers the pH inside the reactor which dissolves some of the crushed calcium media, releasing calcium in to the tank water. The main chamber has a pump on it which draws in water from the tank or sump and recirculates it in a closed loop. There is a tap off out the output of this pump that flows a small amount of water to the second chamber. The second chamber raises the pH of the tank water before it is returned to the tank, thereby using up a little more of the CO2 making, the system more efficient. This second chamber can also be used as a media chamber. It's often used for carbon or sometimes Phosban, GFO or other media. All units require a crushed coral media, capacities listed below. All plumbing connections are 1/4" speed-fit connectors. 6' of color coded input line(blue), CO2 line (yellow) and output line (green) included (18' total). Dual chamber designs in 4' and 6' cast acrylic. Up flow design in both chambers. No plumbing through the top for easy access. No other reactor is as easy to fill and clean! No pipe penetrations though the walls of the tube (A common failure point of other units). Integrated (replaceable) pump comes with the unit, not as an 'extra charge' item. Pump is located out of sight under base. Space-saving design. The smallest footprint available in a dual chamber design, to save valuable space in the stand. Fully water-proof: Impervious to water spills and leaks from other equipment. Fully submergable. Self-filling Bubble counter built in to reactor. Needle valve for adjusting water input/output. All push-fit plumbing connections. The entire unit can be disassembled for pump repair or cleaning. No glued plumbing connections to leak. CO2 scavenge port- Recycles CO2 instead of venting it to the tank. Feed pump note required- Unit can draw from the sump and returns to the sump without another feeder pump. 18' of multi-colored feed/return/CO2 line included. Complete setup instructions posted on the web. Optional regulator and solenoid includes needle valve for CO2 and another bubble counter (required). Optional pH controller available to automatically shut off the CO2 when the pH gets too low (strongly recommended). Optional Probe holder box (PHB) available to hold the pH probe, input and output lines. Optional Flow meter kit- Mounts on PHB or can be free-hanging. Reads in .5 to 8 gph. Unit Ratings: These reactor ratings are based on the included pump with reasonable flow rates, and are very conservative. 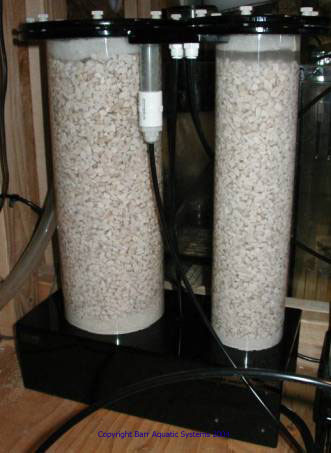 A 300g rating means that that unit can handle any 300g tank, not just a mostly empty system. When comparing units, be sure to compare media capacity, not just the tank ratings. 4" main tube (0.7 gallon capacity), 4" secondary tube (0.7 gallon capacity). Total 1.4 gallon (5.3 liter) capacity. Holds 15 pounds of media. 6" main tube(1.3 gallon capacity) , 4" secondary tube (.56g capacity). Total 1.8 gallon (7 liter) capacity. Holds 19 pounds of media. 6" main tube (1.8 gallon capacity), 4" secondary tube (0.7 gallon capacity). Total 2.5 gallon (9.5 liter) capacity. Holds 24.5 pounds of media. Custom Sizes: Any vertical height is available. Whether you need it taller or shorter just email. Typically there is no charge for making them shorter, and a small charge for making them taller. What is Calcium and Calcium Carbonate? Read Chemistry and the aquarium by Randy Holmes-Farley. Why do you only make Dual chamber designs? 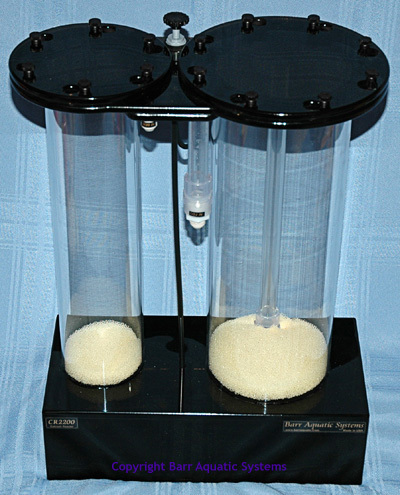 The dual chamber design makes more efficient use of the CO2 than single chamber designs. The second chamber helps raise the pH of the effluent, reducing the pH depression commonly seen with single stage reactors. Yes- Very. The pumps are nearly silent, especially the Eheims. There are lots of kinds of calcium media available. I've only used a few, so don't currently make a recommendation. Check with your local reef club, or on Reef Central for suggestions. How long does the media and CO2 tank last? This depends on your calcium usage. Most reactors need to be topped off with new media about every 6-9 months or so. A 10 pound CO2 tank will last from 9-18 months. Can I run the unit pressurized? Yes- up to 5 PSI or more. 3/8" flanges and O-rings allow it to do very well under pressure. Adding a pressurized setup allows more CO2 to be dissolved which makes a lower pH, and allows a smaller unit to handle a larger aquarium. What are some typical readings? Reactor raised the dKH from 8 to 11 in 4 days in a 200+ gallon frag grow-out system on these settings.